On Thursday, January 18, 2018, on the occasion of the feast of St. Makarios of Egypt (January 19) and in the presence of many of the faithful, evening prayers were held in the shrine (‘kathisma’) which is located in a cave to the north of the Academy in honour of the saint. The Metropolitan Amphilochios of Kissamos and Selinos conducted the evening prayers, and in his brief sermon spoke of the value of the ascetic life, while students of the General Ecclesiastical Lyceum of the Patriarchal School of Crete, with their Principal, Mr Thomas Panagiotou, and their teachers, accompanied the psaltery. 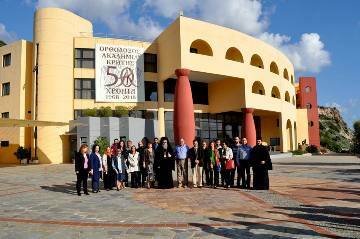 The evening service was followed by a reception at the Academy and presentations by Dr Konstantinos Zorbas, the General Director of the OAC, and Ms Emmanouela Larentzaki, a Scientific Associate of the Academy, who talked about the “Face to Face” Programme, as well as the symbolic importance of the exhibition by Pepi Hatzidaki entitled "My Refugees", on display at the Academy until 31 January 2018. (Opening hours: from 10 am to 1 pm and from 6 pm to 8 pm). 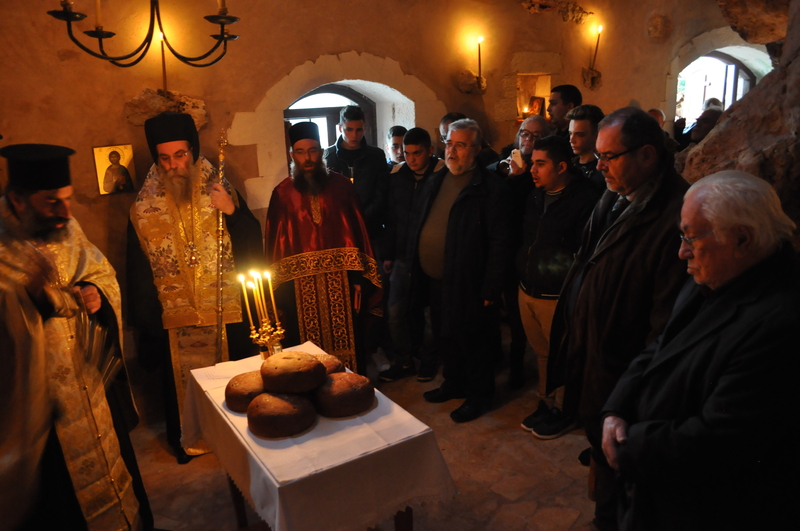 On Friday, January 19, 2016, the Divine Liturgy was conducted by the Reverend Dionysios Dountaki, vicar of the Holy Church of Agia Marina at Kolympari, in the presence of the brothers of the Holy Monastery of Gonia, associates and friends of the Foundation, commemorating the saint and celebrating the 50-year existence of the Foundation. 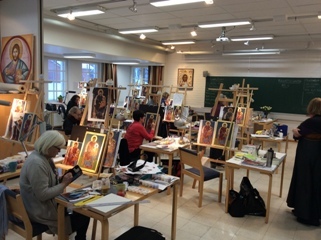 The international Art and Literature Programme run by the Academy for many years now, is based around a story narrated by Saint Makarios containing strong spiritual messages concerning human communication and the ‘face to face’ existence of human beings. 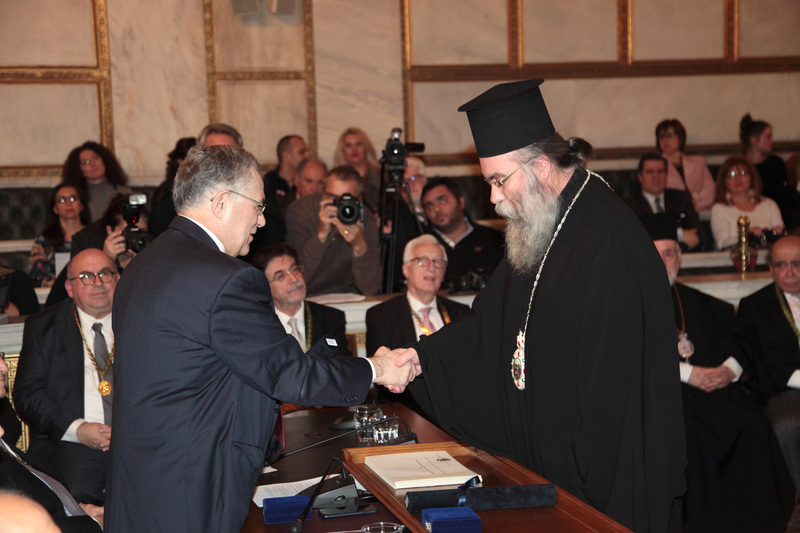 It is important in the difficult days that we are facing in Greece and in Europe to rediscover the true meaning of relationships based on "face to face" communication in society. Because, in the Christian faith, the presence of the other and the society of persons is the definition of Paradise, but the absence of the other and the inability to communicate is hell itself.